Pattinson has reported his findings in his popular blog, “Shut Up About Barclay Perkins,” and in this book, which summarizes his years of archival research. Unlike some homebrewing writers such as Stan Hieronymus or Randy Mosher, Pattinson does not write for the casual beer lover. Most of his book consists of recipes for advanced homebrewers. But all beer lovers have benefited from Pattinson’s diligent research, which has unearthed one previously unknown beer style and corrected long-standing misconceptions about several others. We all know that India pale ale got its start because British brewers created a strong, hoppy beer able to withstand the long ocean voyage to India. But IPAs were not the only beer exported to India. Many brewers, most notably Barclay Perkins and Whitbread, also exported East India porter, which was also hoppier than domestic British porters but not stronger. Moreover, more porter was exported to India than pale ale was, because porter was the drink of enlisted men while officers drank more expensive pale ale. Pattinson believes the reason India porter vanished from beer history is that it wasn’t bottled, but shipped in casks, and while brewers kept making IPAs, India porters ceased production around 1910. However, Pattinson suggests, the next time you have a “black IPA,” you’re not drinking a new style of beer, but a resurrected old one. Also, when we think of imperial stout, we assume that it was limited to the strong beers exported by Courage to Russia. In fact, most brewers had one or more stronger beers that were known as strong ales, Burton ales, or barley wines, which might be between 6% and 7%. Pattinson explains that these ales were very popular in London, but like most British beers in the 20th century, grew gradually weaker as brewers compensated for punitive increases in beer taxes by reducing strength, since beer was taxed on alcohol content. By the 1920s, “strong” Burton ale only was 5%. Mild ale, Pattinson notes, also had a drastic revision in the 20th century. We think of mild ales as very low-alcohol beers, but in the 19th century, “mild ale” was fresh ale, or what we would call cask-conditioned beer, with “stock ale” being beer that was aged for some time before being dispensed. As beer taxes increased, alcohol strength dropped, and mild gradually became the name for low-strength session beers. For reasons that are not clear, mild also became darker. Listing 33 different Whitbread formulations of mild between 1836 and 1950, Pattinson shows that Whitbread mild dropped in original gravity from 1077 to 1032, with the amount of hops per U.S. gallon falling from 24 grams to 9 grams during this period. The final chapter of this book is on German and Polish beers, including grätzer/grodziskie, broyhan, and Salvator, which Pattinson notes was a generic term for doppelbocks until the Zacherl Brewery (later folded into Paulaner) successfully won a trademark suit in the 1890s and turned Salvator into a brand, forcing competitors to adopt the–ator suffix to describe their doppelbocks. As with his chapters on British beers, Pattinson gives a short history of the style and provides historical recipes for homebrewers. 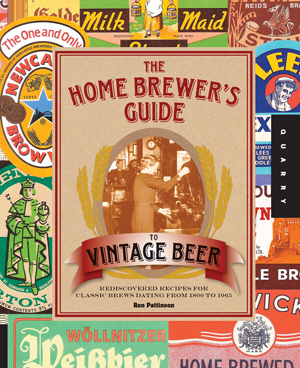 Homebrewers will find many interesting recipes in The Home Brewer’s Guide to Vintage Beer. But anyone interested in British beer history needs to pay careful attention to Pattinson’s research, as he’s shown that many things we thought we knew about British brewing just aren’t true.